So, shaggy hair, totally turn on. 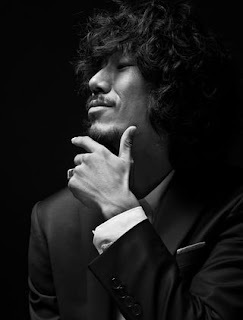 Tiger JK is from the group called Drunken Tiger, but I think I know him better from MFBTY. Drunken Tiger debuted in 1999 (I was 9) the group consisted of Tiger JK, as well as DJ Shine with others joining later. After their sucess he started making music with orginal name MFBTY with Yoon mi-Rae and Bizzy. MFBTY is one of my favorite groups of all times. Weird to say I know but there is something about the trio that really gets me. I like co-ed groups. I didn't forget Jessi does it too, but as much as I like Jessi I have to be honest MFBTY has done it longer and are better at it to me. And how cool is the name "My Fans (are) Better Than Yours." Yoon Mi-Rae ya'll SHOUT OUT TO MY TEXAS GIRL, I just love her so much totally one of the best female rappers in Korea in my opinion. And her voice!!! The girl has been at it since I was 7, and married to the guy ;). But this is about Tiger Jk. I think my favorite album is probably "Year of the Tiger".. take it waayyyy back ...Tiger Jk to me has a place in everyone's heart. He's the founder of two record lables Jungle Entertainment and FeelGhood Music. He's one of the most influential people in the Korean hip hop industry, some might say that he helped bring the hip hop industry mainstream. I mean he's been around for a LONG time. I could write all day about the influence this man has on the industry, but that'd take forever. Untill next time :D this Has been Bunny ... PEACE I'M OUT.